Graveside prayer: Marist Father Seamus McMahon reads a prayer at William Ryan’s grave. BRISBANE Catholics are rallying to make sure the unmarked grave of an Irishman who risked his life for the independence of Ireland soon has a headstone. 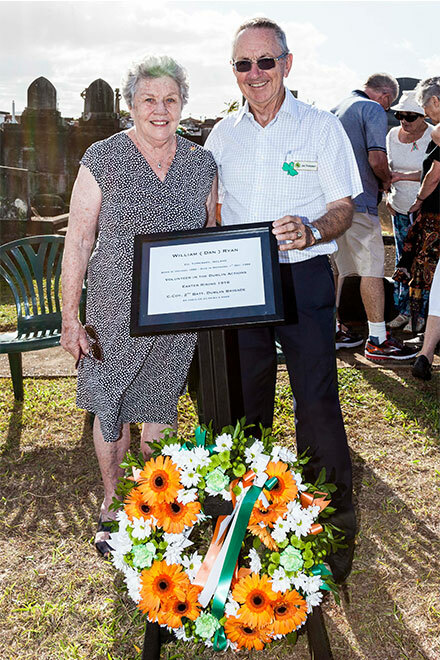 About 130 people gathered around the grave of William Ryan at Nudgee cemetery last Sunday on the 100th anniversary of the Easter Rising in Dublin. Mr Ryan joined fellow Irish citizens on Easter Monday, 1916, rebelling against British rule. He later fought in the War of Independence (1919-21), before migrating to Australia in 1928. He died in Brisbane in 1958. William Ryan’s relatives in Tipperary, Ireland, contacted the Irish Embassy in Canberra hoping to find out where he was buried so that a memorial service could be held at his grave to mark the centenary of the Easter Rising. 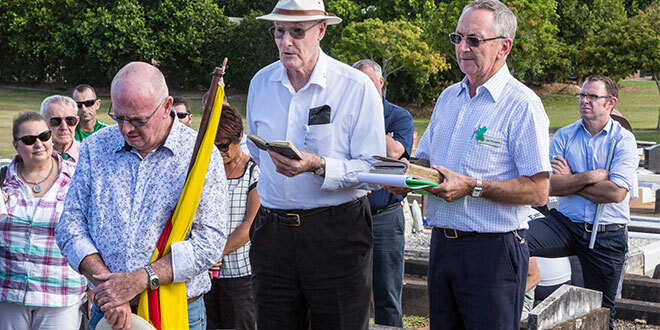 The embassy asked Gold Coast Catholic Joe Thompson, who is secretary of the Irish Australian Support Association of Queensland (IASAQ) secretary, if he could locate the grave and arrange the service. After an exhaustive search and investigation, Mr Thompson was able to grant the Ryan family’s wishes. Remembered: Jill Sloman and Joe Thompson at the unmarked grave of William Ryan at Nudgee cemetery last Sunday. He said the Irish flag was raised at Mr Ryan’s grave last Sunday for the memorial service. He also gave an account of the Easter Rising and told a little of William Ryan’s story. The Proclamation of the Republic of Ireland was read and the crowd sang the Irish national anthem. The Easter Rising was six-day insurrection by Irish rebels against British rule. It began on April 24, 1916, when republican groups seized a number of prominent buildings in Dublin, raised the green-white-and-orange flag over the post office and holed up. For six days 1600 rebels fought off a 20,000-strong British army. The insurrection left about 500 dead, mostly civilians, and thousands injured. About 1500 Irish men were interned in Wales, while the 16 rebel leaders were imprisoned and executed. Mr Ryan was one of the many rebels who fought at the Dublin GPO on the first day. Mr Thompson said those attending the Nudgee service appreciated the chance to mark the anniversary. “It was absolutely fantastic to meet Jill Sloman (who had provided valuable information about William Ryan’s time in Brisbane),” he said. Ms Sloman is a relative of Martin Scanlan who ran the Alliance Hotel in Spring Hill, where William worked as a barman. IASAQ launched an appeal last Sunday to raise about $4500 for a headstone for Mr Ryan’s grave. Mr Thompson said the appeal exceeded the target any extra funds would go to the IASAQ’s benevolent fund to help Irish people in times of need or distress. To donate or for more information, go to the association’s website at www.iasaq.com.au. Previous: Brisbane Catholic Tamsin Jackson was in Ecuador when its worst earthquake struck. This is why she decided to stay.